A nursing glider is basically a chair that moves back and forth to help you soothe your baby while attending to them while also allowing you to sit comfortably throughout the process. 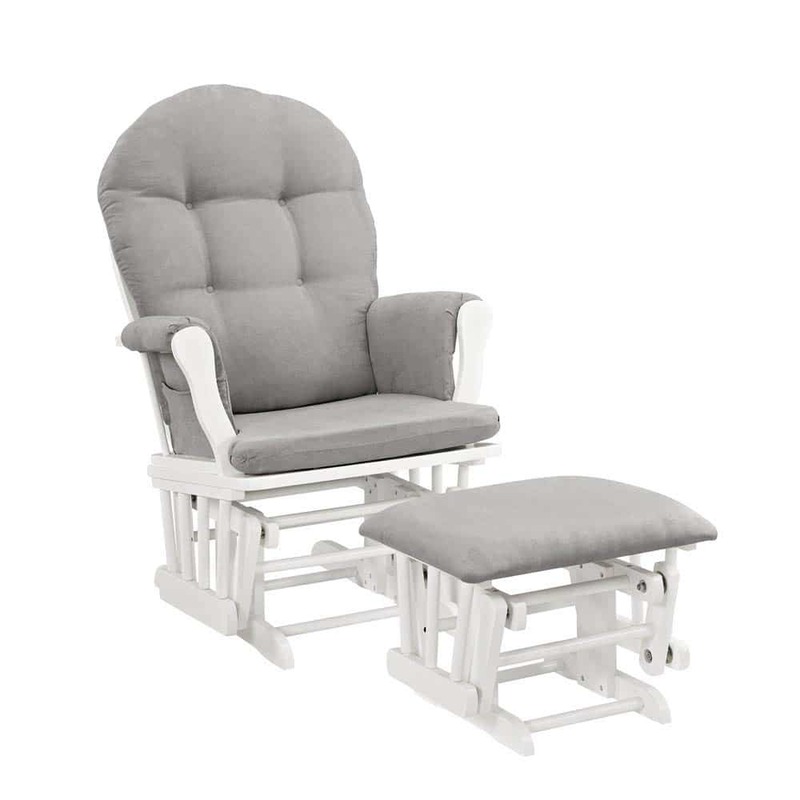 They have upgraded over years from a normal rocking chairs to different nursing gliders with different features depending on the manufacturer. Given the diverse features of the different nursing seats, it is important to understand how they are important to us before getting one. It’s also fascinating how breastfeeding has evolved over time and the innovative ways that have been created to make the process better. What factors should you consider before buying a nursing glider? Where will the glider go? While breastfeeding or soothing your baby to sleep, your arms will need to rest on something firm. A comfortable armrest is one that is spacious and with great padding for both your arm and your baby’s head. An adjustable armrest would also be a great feature to consider. With this, you can raise the armrest as high as you wish or low enough to fit your arm position. Nursing gliders can be used as resting chairs after your baby outgrows the nursing period. A glider with a strong frame will last longer giving you great service over years. This can be achieved by choosing a seat with great and durable frame as well as a strong fabric on the cushion. Babies are naturally messy. Get a seat that will give you an easy time cleaning to save on time. This can be a glider with a detachable and washable seat cover or one whose cushion can detach from the seat for spot cleaning. Although this is not a must-have feature for the nursing gliders, it will be convenient to have one. This way, you will have an easy time while nursing. While it could not be large enough to fit as much items as you would want, it sure is convenient as it can hold your magazines, remote controls, your baby’s toys and much more. Not all nursing gliders come with this feature but it is good to have. A good locking mechanism will make the seat steady and keep it in one position as you recline. It also ensures you have a balance so you can easily get onto and off the chair. Nursing gliders come in different sizes. The size of the chair and its proportion to your body is an important feature. Always go for a glider that fits your body size comfortably. You probably will spend much of your time with your loved one on this seat. Comfort is a must have. Select a seat with great padding on both the backrest and the armrest. Some seats are great since they come with a headrest adding to your comfort. You need a seat that comes with reclining, swiveling and gliding mechanisms. For reclining seats, go for those with different reclining positions for maximum comfort. Be sure to have a locking mechanism at each recline for steadiness. A swiveling chair is also great as it gives you a great 360-degrees view of the room. This way, you can continue doing other things such as conversing with your family sitting in the lounge area and watching T.V. while attending to the baby. Your feet will need a place to rest as you lie on your gliding seat. One option is an ottoman. It works magic for swollen legs and leg pains. Always ensure you get an ottoman that matches the glider height so that your leg does not bend or hang when you place on it. Other seats do not have an ottoman but have a leg rest that props out of the glider which works just fine. Given the importance of leg rest, you will need to incur an extra cost and buy one separately in the case your glider does not come with one. With the above information, you are now a step ahead in selecting a nursing glider that will best suit you and your baby. In this review, we have put together a list of 10 best nursing gliders you should consider in 2018. Why we like it: The Babyletto Madison Swivel glider is lightweight but can support up to 300 pounds. It has metal bearings on the base to offer smooth and effortless movement when gliding. It rotates 360 degrees to give a view of all areas of the room. We like that it takes up little space so you won’t have to worry about where to place it and is both stain and water resistant. You will definitely fall in love with this glider at first site. The microsuede material not only gives the seat a great look but is also soft, stain and water resistant giving you a clean and dry seat all year round. You do not need to have a lot of space in your house to own this glider thanks to its small size that will fit in any corner of your house. Although small in size, the glider has not compromised on the coziness it offers. It is curved at the back and has more seating space to offer you comfort. The seat rests on a metal that won’t hurt your floor. 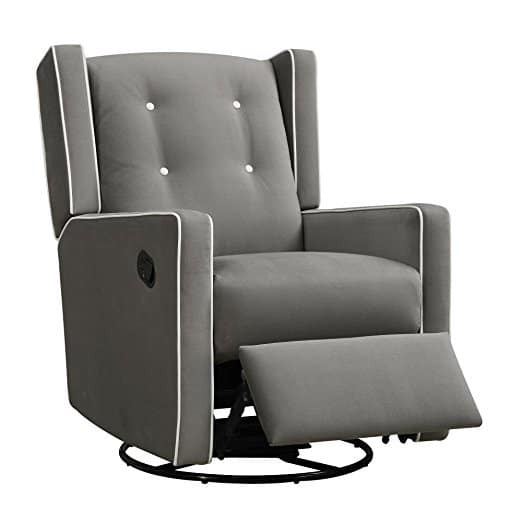 Babyletto Madison Swivel glider comes with great features that boost its performance. It has metal bearings that make back and forth movement while gliding smooth and soothing for the baby and yourself. Tired of being restrained to a corner while nursing? You will love that this glider has been designed to swivel 360 degrees meaning you can rotate as you please to get the view of the entire room. The backrest and cushions are soft to give you a cozy and comfortable feel while on the seat. In addition, the backrest is rounded to give you and your little one even more comfort. Your family will love that they can still rest on the glider after your baby outgrows nursing. If you are an environmentally conscious individual, you will love that the furniture is free of toxic chemicals. The glider also has a 1-year limited warranty so you won’t have to worry about replacement costs in case something goes wrong with it. Our top choice saves on space, swivels 360 degrees and has a great fabric. It is durable with an easy to clean and water resistant fabric. It is comfortable thanks to the spacious seat and the rounded back. Its durability and coziness makes it a stylish addition to your home at a great price. Its small fit makes it a great option for those looking to save on space. Why we like it: Reclines to 3 different positions achieved by a simple pull, offering you super comfort while nursing. 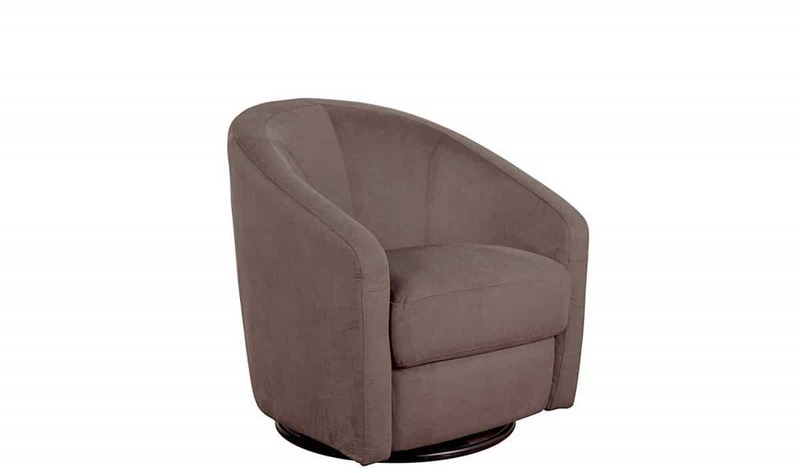 The modern shaped glider has welt trim and button tufts giving it a classy look. We like that it has a leg rest to offer comfort to your legs without taking up extra space. You will like that it offers you 4 different colors to select from. Take full control of your nursing glider by owning the Baby Relax Mikayla glider. It is designed to allow you to change your leg rest and your reclining positions to either fully or partially by just a pull. You can happily support your arms on the armrest of the seat while nursing your baby as they have been designed to offer you comfort. How would you like a nursing glider that offers you 3 different functions? With Baby Relax Mikayla glider, you get to glide, swivel or recline as you please. Whether gliding or swiveling, you will always be comfortable thanks to the glider’s ball bearing tool. The mechanism ensures a smooth backward and forward movement when gliding, and a smooth rotation when swiveling. The glider is stylish and easy to assemble. The cushions are easy to clean and supports up to 225 pounds. The Baby Relax Mikayla glider is stylish, versatile and extremely comfortable. Its ability to recline to 3 different positions while giving you the option to swivel or glide makes this a comfortable seat. The comfortable spring core foam, swivel mechanism and smooth gliding provides great coziness that could work perfectly for twins. Why we like it: The Naomi Home Brisbane glider has been constructed with a strong wooden frame that makes it durable and stable. Its thick cushions and roomy seat offers maximum comfort. We like the convenience of the storage pockets to keep your belongings and the ottoman for your legs. Naomi Home Brisbane glider has been built from solid and quality material thus sturdy and durable. It has a large seating space giving you comfort while nursing. The ottoman adds to your comfort as you can put your legs up and get comfortable. In addition, the ottoman’s and seat’s cushions are thick giving you a relaxed rest. The seat comes with storage pockets where you can put magazines, T.V. remote, your baby’s toys, among other things for your convenience. The Naomi Home Brisbane glider has been built to last thanks to its strong wooden frame. The frame also makes this a super sturdy seat so you won’t have to worry about the seat gliding when you don’t want it to. It comes with metallic bearings that make moving back and forth with the chair smooth. This will soothe your baby to sleep and also helps you to relax after a long day. The backrest has been padded to add to your comfort while nursing. When it comes to cleaning, you will love that both the ottoman and the chair clean easily. It comes with an ottoman so you won’t have to purchase a separate one. Its durability ensures you do not have to worry about purchasing a new glider for your next child. Lastly, putting up the glider is easy and its kit includes the tools required to assemble it. The Naomi Home Brisbane glider is made from a strong material thus durable. It offers great comfort with a roomy seat and padded arms. It offers a smooth gliding while you nurse your baby an is easy to assemble giving you quality features and value for your money. Why we like it: The Dutailier Sleigh glider has a great mechanism that can lock the seat in 6 different positions giving you different resting options. We like the lock on the seat as it makes it easier to get on and off the seat. It also has top quality enclosed ball bearings for a smooth and long gliding. 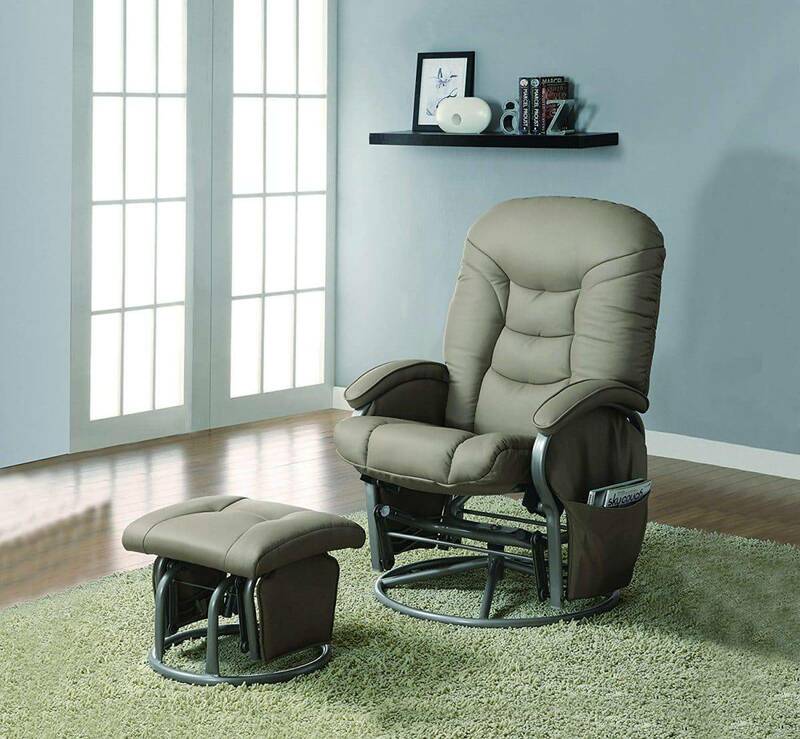 You will love that this glider puts together the best of features to offer you convenience. First, it is made of 100% polyester so you won’t have to worry about the seat creasing every time you sit on it. It comes with an ottoman so you can put up your legs and rock your baby comfortably. Its backrest can be adjusted fully to recline for your back’s comfort. The cushions are thick and the arms padded, to add to your comfort. How would you love a seat that offers you multiple resting positions? Dutailier Sleigh glider has been designed to lock in 6 different positions offering you comfort and making it easy for you to sit on the chair and to get off. The metal bearings on this glider are of great quality to ensure a quiet and easy movement as you glide from one position to another and back. The cushions on the seat and the ottoman are well padded to enhance your comfort. The 6-positions locking mechanism is a unique feature not found on most nursing gliders. Its ottoman comes with the seat so you won’t have to buy separately. With no sharp edges and with a finish that is toxic free, this glider is safe for both you and your family. The hardwood frame ensures the glider can be passed onto the future generations. The Dutailier Sleigh glider has an adjustable back that reclines to different positions with a lock for sturdiness. The padded arms and thick cushions offers great comfort to you while attending to your baby. If you are looking for a stylish and comfortable nursing glider or one to just relax on, consider this glider. 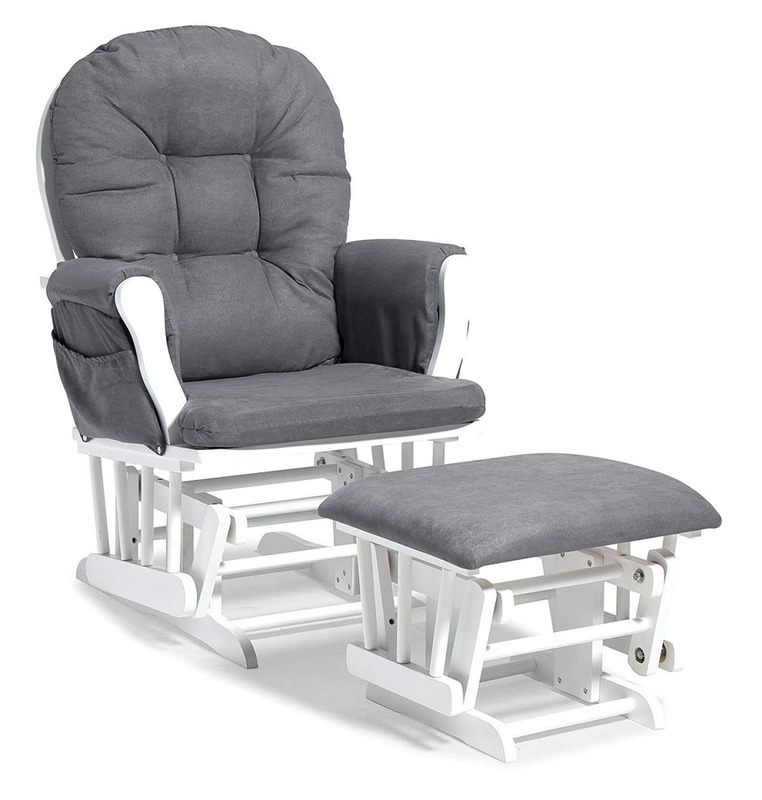 Why we like it: A sturdy nursing glider with an ottoman for your feet while nursing. We love the metallic bearings on the glider that ensures a smooth back and forth movement. The cushions of the seat can be detached for easy cleaning. 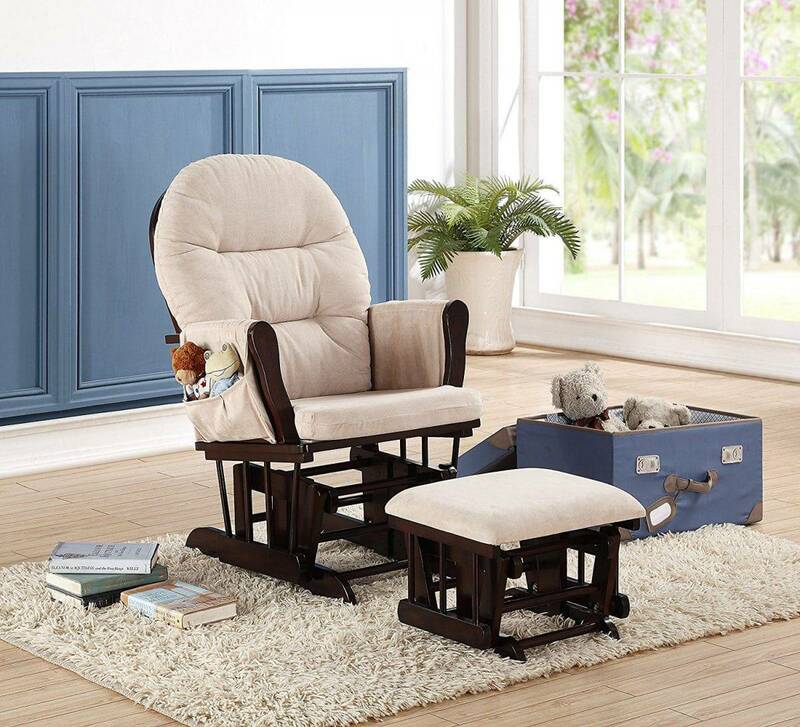 The glider has spacious seating room with padded arms to offer you comfort while nursing. Looking for a nursing glider that has put your nursing needs to thought? The Angel Line Windsor glider’s material is 100% polyester meaning it is strong, will dry easily after cleaning and is resistant to wrinkles. To add to the easy to clean material of the glider are the removable seat cushions which will make it easier for you to clean in case of spillage. The frames on the ottoman and glider are strong to ensure stability. The metal bearings on both the glider and the ottoman will give you and your baby a smooth and soothing gliding motion. The seat has a large seating area that keep you comfortable while nursing. To add to your comfort are the padded arms and pockets where you can store some items you might need while nursing. The glider comes with an ottoman to offer you great comfort as you nurse meaning you will not have to buy it separately. 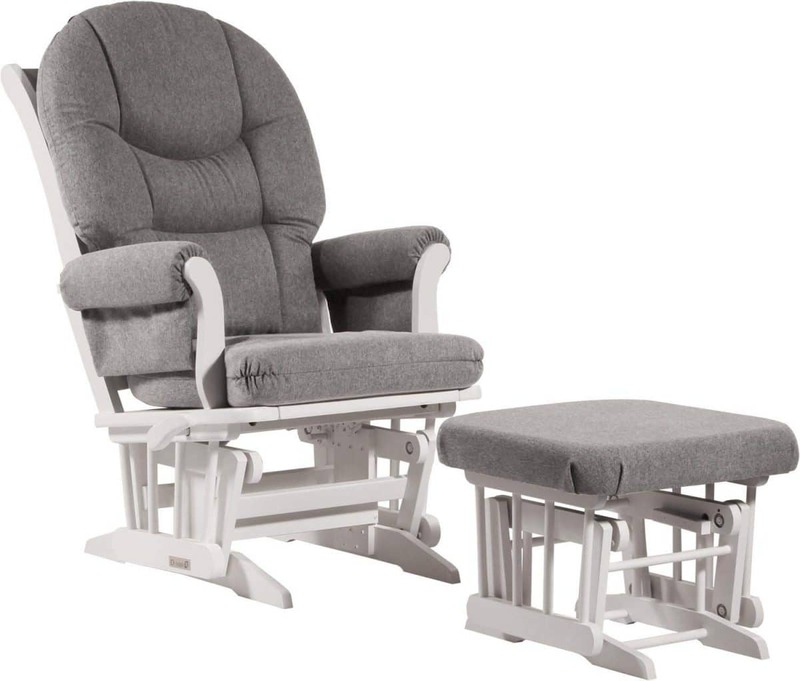 The Angel Line Windsor glider has a roomy seat with padded arms for maximum comfort. It is easy to clean and has storage pockets that will keep what you need within reach. Its gives you value for your money and great comfort for both you and your baby. Why we like it: The Windsor Glider and Ottoman offers a large seating space for your comfort. It has enclosed metallic bearings that are protected from moisture and dust to give you a smooth movement as you glide on the seat. We like the storage pockets that will keep the items you need while nursing within reach. You can support your arm comfortably while holding your baby thanks to the gliders padded arms that will offer you great support throughout your nursing. You will love the ottoman which allows you to stretch out your legs and place them on a soft cushion when you want to rest. To add to your comfort is the chair’s large seating space that ensures you can relax with your baby stress-free. The chair has storage pockets where you can keep your magazines, baby’s toys and anything you might need while nursing. No need to worry about the stability of the chair as the firm frames on the ottoman and the glider has this covered. In case of spillage, you can easily clean the stained area thanks to the detachable cushions on the seat. After a long day’s work, you will love that the metal bearings will let you rock the glider smoothly while holding your baby. The seat is easy to assemble and comes with an ottoman so you won’t have to buy one separately. The Windsor Glider and Ottoman has a roomy seat and padded arm rests to keep you cozy while attending to your baby. The button tufts on the backrest adds to the style of your nursery. Its affordability coupled with the great features makes it the best nursing glider on a budget. Why we like it: The Coaster Deluxe Swivel glider rotates 360 degrees so you can have the view of the entire room with just a turn. Its pillow arm is attached on a steel frame making it strong to offer great support to your arms while nursing. It comes with an ottoman and its cushions are covered in leatherette making them durable and giving the seat a classy look. How about a glider that you will live to pass on to your next babies? The leatherette fabric ensures the durability of the glider. For comfort, the armrest has been placed on top of a steel frame to fully support your arms. The headrest is also designed to offer comfort for your convenience. It is meant to not only glide but also recline and swivel. 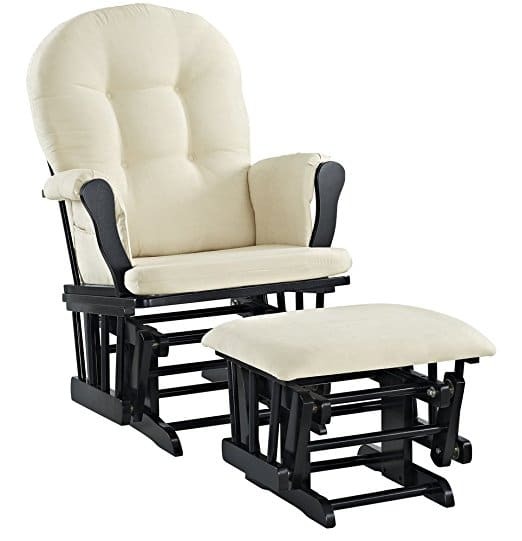 The Coaster Deluxe Swivel glider has been designed to perform better than a usual rocking seat. You can easily use an external handle to recline the seat to hold your back better as you lie on it. In addition, the seat has been designed to offer a smooth and quiet glide. You will love that you can watch T.V. in this seat with just a turn thanks to the swivel mechanism that allows the user to rotate 360 degrees. The glider and swivel functions are smooth because of the seat’s strong rounded base. The elegant look of this seat offers more than just style. The thick padding and rounded front ensure comfortable relaxation by supporting your weight and that of the baby. The padded ottoman that also rests on a firm steel elevates your feet to reduce foot pain and swelling. The ottoman’s base makes it easy to move it around the house. Not to forget are the storage pockets where you can store things you’ll need while on the seat. The seat is easy to assemble so it won’t take up much of your time. It adds to your home’s beauty with the casual modern-day design. The contoured seat, swiveling, gliding and reclining ability of this seat makes it perfect for your family’s daily use. The headrest makes it a great seat for individuals of average height. The Coaster Deluxe Swivel glider can be locked at your preferred position and allows you to keep gliding even when it is locked. Assembling the seat takes only about 30 minutes. The durability and versatility of this seat make it a great glider for day to day family use whether for rocking a baby or for resting. 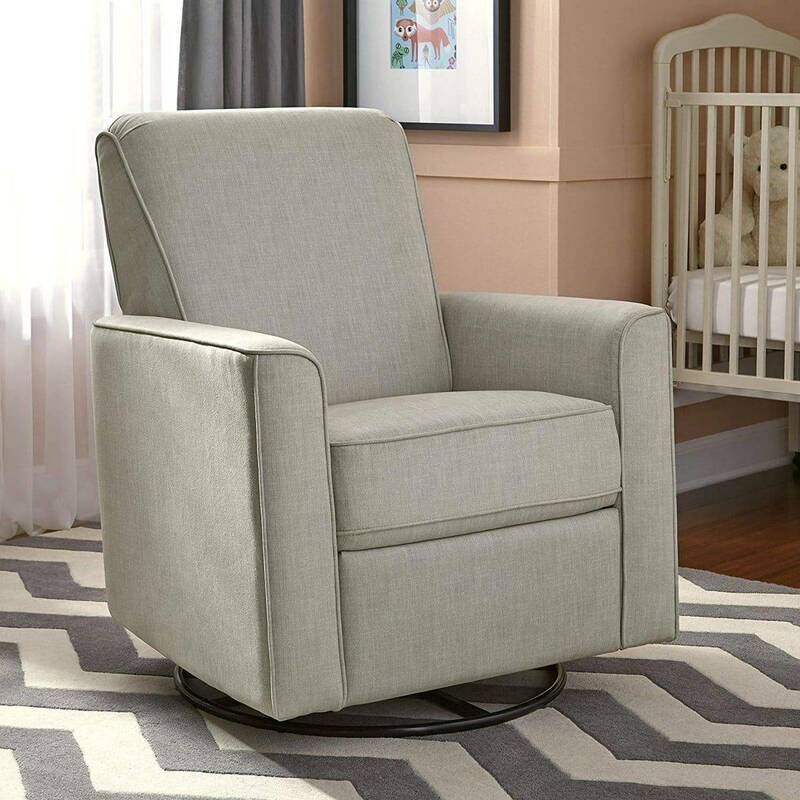 Why we like it: The Delta Children Blair Nursery glider has durable metal mechanisms for a gentle and quiet swivel. The frame is strong, steady and durable. We like that it has been designed to take up small space so you won’t have to worry if you don’t have a big room. The seat is also easy to clean. If you do not have enough space in your house and you are worried about cramming it up, then this could be the best glider for you. It is designed to take up small space in your house hence can fit in most places. It has quiet movements thanks to the strong materials used to manufacture the seat. You will love how the durable fabric cleans with less hassle. As earlier mentioned, the seat has a firm wooden frame ensuring steadiness while on the seat. What is great about this glider is that it swivels. Swiveling will ensure you can do other things such as watch your favorite T.V. show, converse with your family and do much more from the same spot. It is also designed to offer a gentle and quiet glide and swivel to soothe both you and your baby. The seat has been thoroughly tested to offer safety for you, your baby and your entire family. When it comes to comfort, the thick pads on the armrest are perfect for your arms as you breastfeed your child. The wooden frame of Delta Children Blair nursery glider will grow with your child past their nursing age thanks to its durability. You cannot assume that the cushions are detachable for easy cleaning mostly for the working and busy moms. It is available in 3 different colors so you won’t have to limit yourself to one choice. The Delta Children Blair Nursery glider is a versatile seat that takes up as much space as you can afford. It comes with durable metallic mechanism to offer quiet and gentle gliding. Given its durability and comfort, this could just be the best glider seat for the price. Why we like it: It offers a complete 360-degrees swivel with a quiet and smooth tilt back. It is generously padded on the backrest, arms and seat for comfort. Its fabric is durable and also easy to clean. We like the drop-in hidden coils that prevents the seat from sagging. How would you love a glider that can be used by everyone in your family and doesn’t take up much space? With Pulaski Harmony Swivel glider, where to place it will not be an issue as it has been designed to easily fit in any room in your home. With the 360-degrees full rotation, the glider will be a favorite for your entire family and of course you while feeding your baby. The full rotation will enable you to turn to whatever side of the room. The backrest and arms have been generously padded to give you comfort while on the seat. 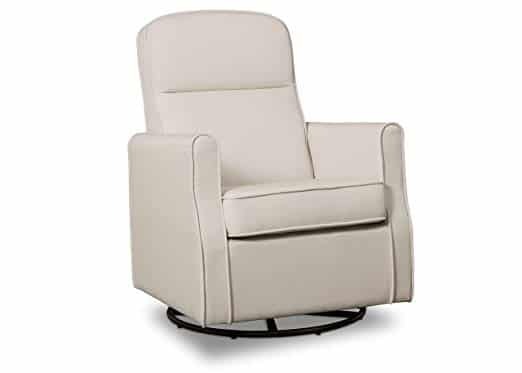 The Pulaski Harmony Swivel glider has been designed to offer great comfort to the user. First is the seat’s ability to swivel for a full view of the room. The swivel is quiet and smooth thanks to the 53 metal bearing base designed just for that. It also tilts behind relaxing your back as you use the seat and has a place to rest your legs. The track arms are sufficiently padded to add to your comfort. As you rest on the back of the seat, you will appreciate the great padding that gives maximum relaxation. The glider has been designed with coils to keep you from sagging as you sit on it. Its fabric is soft and long-lasting. The Pulaski Harmony Swivel glider makes a good resting seat even after your child outgrows it. It comes with a backrest, armrests and a seat that are generously padded for maximum comfort of the user. Its sleekness and small-scale design might just make this the best option for those looking to achieve both comfort and style for their small home. Why we like it: The Stork Craft Custom Hoop glider seat and back cushions are detachable and their material is high quality and easy to clean. It has a storage pocket that makes it easy for you to access your belongings. We like that it offers you the option to select your most preferred color for the cushions and the base from a variety of choices. Get yourself comfortable as you bond with your baby on Stork Craft Custom Hoop Glider. You will love that you can customize your glider and ottoman to your nursery with a range of different combinations to select from. The seating space on the chair is large enough for you to get comfortable. 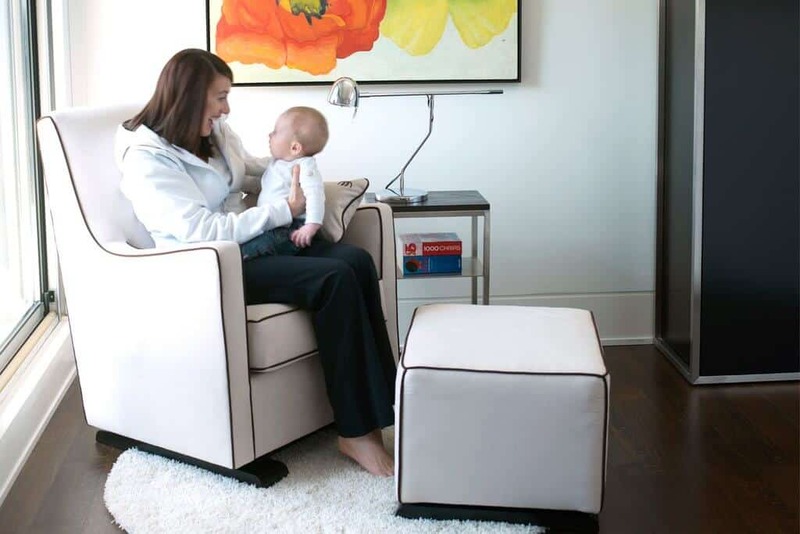 The padded armrest will offer a comfortable place to support your arms while holding your baby as the ottoman takes care of your legs. The seat’s storage pocket will come in hand for your magazines if you love reading or for any other thing you might need such as your baby’s toys. How about a hassle-free gliding? Stork Craft Custom Hoop Glider has metal bearings that will smoothen your back and forth motion calming your baby to sleep. The wood base is sturdy so you can have the confidence to put your legs up without worrying about breaking it. The option to choose cushions and base from several varieties is a plus for this glider as it does not dictate your selection. When it comes to cleaning, you will love that the back of this glider and cushions are easy to clean. The seat can be set up with less hassle without wasting so much time. You will also appreciate that the parts of this seat can be replaced at no cost in case it is damaged. The Stork Craft Custom Hoop glider is easy to assemble and has an easy to clean durable material. The enclosed ball bearings will ensure a smooth gliding to the user. The glider considers a number of features to keep both the baby and the parent comfortable making it a great choice for both comfort and style. As the glider moves back and forth, it soothes the baby comforting them making it easy for you to feed them. It will also be easier to breastfeed with your arms and the baby’s head well rested on the seat’s armchair. As the glider rocks back and forth, your baby will relax and get to connect with you as you fondle them. It is important to get a good seat that will offer both you and your baby a great time so as to not to disturb them. Nursing gliders with good padding on the cushions will give your back support allowing it to rest. This helps alleviate back pains. For gliders that have ottomans, resting your legs on them while relaxing can relieve you from swollen and painful feet. Of course one of the reasons you would opt for a nursing glider other than a rocking chair is that they work better. The unique features of a glider make life easier and parenting an easy task. Way before your baby comes along, you will need a glider for your own convenience. When it becomes hard to sleep on the bed, you can always turn to a nursing chair for extra comfort. Place your legs on the ottoman, glide back and forth and make yourself comfortable on the seat as you wait for the baby. You don’t have to be nursing a baby for you to use a nursing glider. These seats have been designed for maximum comfort and you can always rock them to unwind. Your glider should not only be comfortable for nursing but also allow you to perform other functions. The glider must smoothly and quietly rotate and you should also be able to tilt it back easily without having to put down the baby or getting off the chair. Assembling the seat should also be an easy task. If you are installing a nursing glider for the first time, here is an example with Stockcraft Glider Rocker. Where you will place the seat in your house really matters for various reasons. Placing the glider in the nursery might be great to keep the baby from distractions but will not work well for you as you will be away from the rest of the family and could feel lonely. Placing it in the lounge room could be a better option as you will connect with your family and get busy doing other things such as watching the T.V. Placing it in your bedroom could be the best option while attending to the baby at night but not the best when morning comes. During the day you will get bored spending most of your time there in your bedroom. You do not want to buy a glider that will be a hassle finding space to fit it. The market offers different sizes of nursing gliders and it would be great to select what fits in the available space. Space should be enough for you to rock back and forth with ease. Where you place the seat should be away from sunlight and other elements that can affect the baby. The space selected should also not interfere with your family members’ movement within the house. Give enough space to everyone for theirs and your comfort. If you are getting the seat for your own use or maybe consider prolonging the use after your child is out of the nursing period, you will need to consider a number of features before buying. The glider needs to be durable to last longer for your use and extra comfortable to allow you to rest. The user’s feet need to touch the ground for them to be able to rock the chair back and forth. Most seats will not work well for tall parents. With a seat that is too low, tall people’s legs bend making them uncomfortable. For short parents, deep seats will not work for them as they sink leaving their feet suspended. It will also be hard for them to get on and off the seat. For plus size users, you will need a generously padded cushion at the backrest and the armrest. With the weight of the baby added to them, be sure to confirm the maximum weight the seat can support before buying. Most seats will fit individuals of average weight so you won’t have to worry much about them. Last but not least, we cannot dismiss the importance of how much you are willing to spend on the nursing glider. With a number of gliders with great features in the market, you do not have to break a bank for you to buy one. With our review above, you can easily pick a nursing glider that best fits your budget. The safety of your family and yourself while nursing is important. You do not want a seat that will topple as you sit on it or one with edges that would hurt anyone bumping into it. Choose a chair that is sturdy enough and one with smooth edges for the safety of those around you. To get great value for your money, you will need to consider the extra features that come with the seat you are considering. You can get great value ads such as an ottoman, gliding and swiveling mechanisms, padded armrests and headrest without having to spend more. Explore our list of best nursing gliders to get the best selection. These are nursing gliders that tilt back offering you a better rest. Different seats have different reclining positions. You can get up to 7 different reclines in one seat. These are nursing gliders that glide back and forth along the length its platform is built on. It performs better than an ordinary rocking chair. Some gliding chairs also have reclining functions. Its back and forth movement are in a motion that is not as smooth as a gliding one. In addition, the gliding nursery glider has better comfort features such as softer padding compared to rocking nursery glider. The most economical nursing glider. They are simple and comfortable but will still perform the functions of a nursery chair. We believe that the guide above on best nursing gliders will give important tips you need to select the best nursing gliders in 2018. Whether working on a strict budget or willing to blow it up, getting one for comfort or for a small room, we have carefully selected the best nursing gliders that will work best for you. Shopping for a new nursing glider will become an easy and fun task for you.